Bird's eye view: Bloomfield Lodge. Alissa Jenkins heads to far north Queensland to try out Bloomfield Lodge: an intimate destination with a reputation that has been spreading both organically and fast. Over the past two years, while curating results for AT’s annual Readers’ Choice Awards, there’s been one unfamiliar operator reappear time and time again. Amidst a smattering of glowing comments from voters, it’s been nominated for best luxury hotel, most romantic destination, best B&B… However it’s none of the usual suspects; not a Crown property, nor a Hyatt or a renowned Whitsundays resort. It’s also yet to receive enough votes to take out a finalist position. Going by the name of Bloomfield Lodge, you’ll find it tucked away in tropical Far North Queensland. Never heard of it? Neither had I.
Arresting sunset from Bloomfield Lodge. But savvy AT readers aren’t the only ones privy to the lodge’s charms – it’s also a member of Small Luxury Hotels of the World and was ranked number one for ‘World’s Best Remote Hotel’s by Forbes Magazine. So when the opportunity arose to finally check out this award-winning getaway, there was a shrill scream of excitement – the kind that tweens make when watching the Beibs’s latest music clip. Getting to this mythical eco lodge, however, is no mean feat. 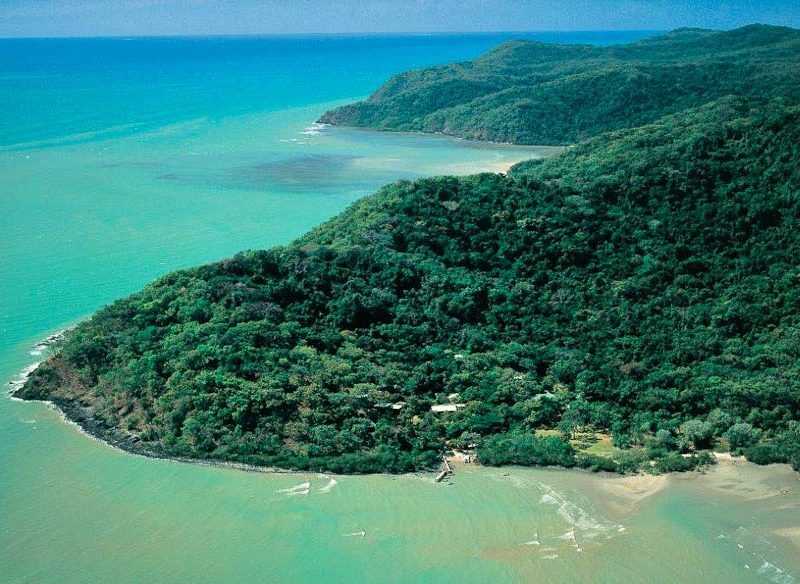 Sandwiched between world heritage listed Daintree Rainforest and Great Barrier Reef, it’s perched atop Wongabadga Point which overlooks Weary Bay, just beyond the mouth of the Bloomfield River. Secluded luxury accommodation at Bloomfield Lodge. You essentially have three options of accessing it: self drive to Bloomfield River and get a boat transfer across (free of charge), a scenic flight from Cairns direct to the Bloomfield (from $280), or book a private helicopter to the lodge ($1009). We opt for the least expensive option. After a whirlwind two days driving up Queensland’s far north coastline, I’m worn out and travel tired when we arrive at Bloomfield jetty late one afternoon. However, I’m not the first. A certain Captain James Cook was hardly chipper when he arrived in the area in 1770. 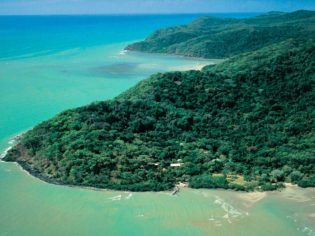 After the HMS Endeavour took a hammering after it navigated through the Great Barrier Reef, Cook and his crew weren’t a cheery bunch, giving local landmarks names like Cape Tribulation, Hope Island and Weary Bay– which we cross en route to Bloomfield Lodge. Happily, arriving at Bloomfield Lodge is like taking both your first breath of country air and a bite of a chocolate soufflé at once – refreshing and indulgent. The boat is towed up the beach to the lodge’s entrance (no guest gets their toes prematurely wet), before we’re escorted onto land and luggage is taken to our rooms. Meanwhile, our host, Courtney, guides us up a flight of garden-lined stairs, straight to the lobby bar to check in over a Pimm’s and lemonade. This is the heart of the property, where guests come to dine, drink and cool off in the infinity pool, overlooking Weary Bay. Better still, you can help yourself to the bar and create your own cocktail concoctions whenever you please. Suddenly I’m not so weary. Then we get to the rooms, 17 of them, nestled between trees and gardens so as not to overshadow the rainforest setting. However, the pathways that thread between rooms can become quite steep in areas so this probably isn’t the easiest retreat for travellers with mobility issues. Nonetheless, with five room configurations suited to families and couples, at the top of the pecking order is the ‘Bloomfield Suite’, which I’ve managed to get myself into for the night. As soon as I walk in – luggage already waiting at the door, a perfume of citrus and jasmine lingers in the air, which I later learn is Bloomfield’s own signature scent. A plump king-sized bed takes pride of place, but I race past it, and the lounge area, and the mini bar, out through large glass windows to the balcony. Far from your standard hotel ‘balcony’ that barely fits two chairs, this is spacious, private and a highlight of my stay. With front-row seats to a painterly Weary Bay sunset, the balcony comes with an outdoor dining area, queen-sized day bed and, wait for it, a hot tub. I don’t want to be anywhere else. That’s until I get hungry. Meal time is as intimate or as social as you make it. I join a table with 12 other guests and although it’s a set menu, the kitchen can alter it for any dietary requirements. Tonight it’s sweet corn soup, juicy steak and char-grilled vegetables. Looking around, I’m surprised by the demographic of guests – almost all Australians enjoying their retirement. I expected a wider slice of the domestic travel pie. The breakdown of guests here is usually around 55 percent retirees, 40 percent young couples and five percent families. And 60 percent of that are international travellers. Being so close to the water – and nothing else but rainforest, Bloomfield guests can also enjoy falling asleep to the sound of lapping waves. Literally. It’s a delicious luxury. The next morning, I’m no longer weary but certainly woeful that it’s already time to leave. Bloomfield might be little known, but I hope it stays that way until I return. Unfortunately, I didn’t get time to indulge in the smorgasboard of activities available to guests. Fortunately for you, you can learn from my mistakes. Onsite alone is a pool, spa, library and fishing – both directly off Bloomfield’s private jetty and further afield on organised tours. There’s also plenty of rainforest walks, as well as river cruises and bird watching to be done.